Diabetic Neuropathy is a type of nerve damage that occurs in people with diabetes. The nerve fibers throughout the body are affected by high levels of glucose in the blood. Diabetic Neuropathy usually causes nerve damage in the legs and arms. Symptoms of diabetic neuropathy can be quite varied. For example it can be pain and numbness in the extremities. It can also cause problems with the digestive system, urinary system, blood vessels and even heart problems. These symptoms may be mild for some people with diabetic neuropathy, but for other people, diabetic neuropathy can cause severe pain, physical disability or death. Diabetic Neuropathy can cause much suffering as the disease progresses. Fortunately, you can prevent or delay their complications by maintaining a strict blood glucose control and also having a healthy lifestyle. Signs and symptoms of diabetic neuropathy vary depending on the type of neuropathy and nerve affected. Diabetic Neuropathy can be classified into four main types. You can have symptoms of various types. In most cases the symptoms come on gradually and may not be noticed at the beginning, but only when significant damage has already occurred. Numbness decreased ability to detect changes in temperature and does not feel pain. There tingling or burning for no apparent reason. Cramps and sharp, shooting pains. Balance and coordination of movement is lost. Urinary tract infections, urinary retention and urinary incontinence. Gastric problems such as nausea, vomiting, swelling or loss of appetite, difficulty in swallowing. Erectile dysfunction in men and sexual problems in women. Increase or decrease in the ability to sweat. Increased heart rate when resting. When the nerves of muscles, hips, buttocks or legs are affected is called Radiculoplexus neuropathy, diabetic amyotrophic, femoral neuropathy or proximal neuropathy. This occurs mostly in older adults with type 2 diabetes. Symptoms usually occur on one side of the body. Sudden pain in the hips or buttocks muscles. Mononeuropathy is specific nerve damage. The nerve can be in the face, leg or torso. This neuropathy also called focal neuropathy and usually come on suddenly. It is common in older adults. Mononeuropathy can cause severe pain but may disappear with treatment and does not cause long term problems. Double vision or pain in the back of an eye. Pain in the foot or calf. Pain in the pelvic area or lower back. When a nerve is compressed it also causes Mononeuropathy. This is the case of carpal tunnel syndrome and is very common in people with diabetes. Some of the symptoms of carpal tunnel syndrome are: tingling and numbness in the hand and fingers, particularly affects the thumb, index finger, middle finger and ring finger. Loss of strength in the hand cannot hold objects. An inflammation of the nerves due to an autoimmune response, this can occur when the immune system attacks without reason a body part. Some people are susceptible to suffer nerve damage by genetic factors related to diabetes. Alcohol abuse and smoking damages the blood vessels, nerves and increases the risk of infection. All people with diabetes can develop neuropathy, but there are factors that contribute to a person developing diabetic neuropathy. Poor control of blood sugar levels, this is one of the most important risk factors that can cause severe complications including nerve damage. The best way to protect the health of blood vessels and nerves is to maintain a level of blood sugar within the normal range as possible. How long with diabetes: The longer suffer from diabetes; the risk will be greater, especially if you have no good control of blood sugar levels in the blood. Kidney disease: If diabetes has damaged the kidneys, blood will have more toxins and this will contribute to nerve damage. Overweight: If the body mass index is greater than 24, the risk of developing diabetic neuropathy increases considerably. Smokers: The person who smokes has hardened arteries. The blood flow to irrigate the legs and feet is reduced. The consequence of this is that the wounds heal with difficulty and peripheral nerves are damaged. Loss of a limb. The person with diabetic neuropathy may have numbness in your feet or hands. For that reason a wound or sore can become infected, especially the skin and soft tissues. The risk increases greatly because diabetes reduces blood circulation in the feet. The infection spreads very quickly and the bone tissue dies, this causes gangrene that may be impossible to cure. As a result the doctor will need to cut your finger, foot or even leg. Charcot joint. It occurs when the foot joint is affected due to nerve damage. No loss of sensitivity, instability and inflammation, even joint deformation. Urinary incontinence and urinary tract infections. When the nerves that control the bladder are damaged, the bladder does not empty completely. As a result the bacteria multiply and can get into the kidneys. The nerve damage can also affect the muscles that control urine release. 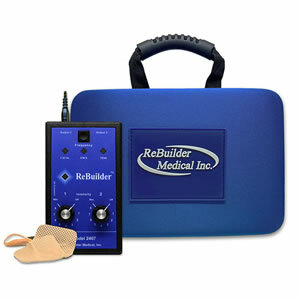 The ReBuilder® is ideal for all types of neuropathy, regardless of the cause. Therefore it is applicable for peripheral neuropathy, diabetic neuropathy, autonomic neuropathy, mono-neuropathy, sciatica, poly-neuropathy, etc. Walking without pain and with good balance. Having a quiet, pleasant and painless sleep. Rebuild and strengthen muscle mass. Reduce or avoid taking pain medication. Avoid the side effects of pain medication as tiredness, memory loss, confusion, etc. It is available in two models: ReBuilder® 2407 and ReBuilder® 300. For more information about the neuropathy treatment with ReBuilder Medical and the available packages, click here.